Before the season starts, it is a good idea to have your central AC system tuned up. a visual inspection of your ductwork and all other equipment. While some individual items could seem to be insignificant, not doing them can ruin your system over time. Different companies express what it is they do by calling it different names (“28 point checkup”, “precision tune up”, or just maintenance), but the basics remain the same. All the while, you could spend exponentially more money by running your poorly maintained air conditioning system. If you are looking for a way to lower utility bills and cut costs this summer, tuning up your homes HVAC system continually proves to be a worthwhile and sound investment. Don’t just take our word for it. EnergyStar has an article on residential air conditioning maintenance that you can read here. Below are lists of services that are performed on your HVAC system during a normal maintenance visit. Note: Not all items apply to every situation. Additional cost may apply according to existing unit condition in accordance with individual maintenance plan and contract. 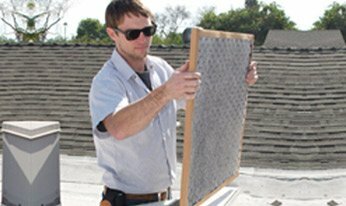 How do I change an AC system filter?